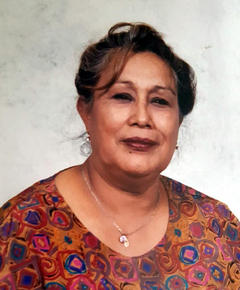 Felicita R. Romero, 77, passed away Thursday, October 4, 2018 in Lubbock. Services for Mrs. Romero will be 10:00 am Tuesday, October 9, 2018 in The Chapel of Broadway Funeral Directors with Pastor Johnny Perez officiating. Burial will follow at Peaceful Gardens Memorial Park under the direction of Broadway Funeral Directors. A prayer service will be held 7:00 pm Monday, October 8, 2018 in The Chapel of Broadway Funeral Directors with a visitation beginning at 9:00 am. Felicita was born January 19, 1941 in Karnes City to Julio & Felomena Ramirez. She married the late Jesus Romero in 1953 in Lubbock. She enjoyed singing, gardening and loved spending time and visiting with her family and grandchildren. She is survived by two sons, Gabriel Romero, Jesus Romero Jr. both of Lubbock; two daughters, Delphina Losoya of Lubbock, Yolanda Tijerina of Ralls; two brothers, Julio Ramirez Jr., Rudy Ramirez; two sisters, Delia Padilla, Christina Salazar; eighteen grandchildren; forty-four great grandchildren; seven great great grandchildren. She is preceded in death by her husband, Jesus Romero; a son, Santos Alejandro Romero; three brothers, Domingo Ramirez, Frank Ramirez, Henry Ramirez; one sister, Leonor Rodriguez.